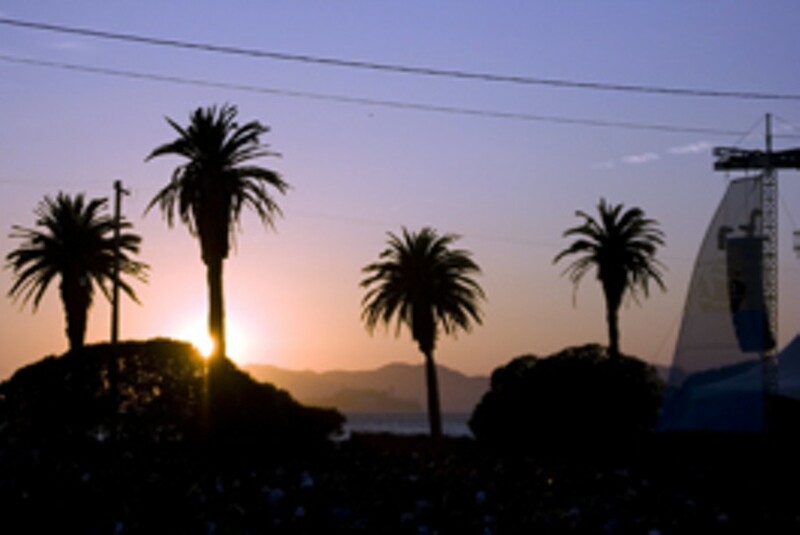 It's no secret that one of my favorite concert-going experiences is the Treasure Island Music Festival, a two-day soiree out in the middle of the San Francisco Bay with an incredible lineup and a beautifully scenic setting. Festival organizers say the choice for Treasure Island was born—even before last year's inaugural event—purely of necessity. All the viable locations within the city of San Francisco were already spoken for. But the forgotten plot of man-made land in the bay turned out to be one of the most inspired venues in the entire overblown, countrywide festival phenomenon, with the island itself sculpting the unique feel of the two-day experience. Isolated yet metropolitan, the festival provides a paradisaical indie-rock getaway beneath the bustling loom of both the Golden Gate and Bay bridges. With the organizers also planning the gigantic Outside Lands Festival in Golden Gate Park this year, I expected that a second year on the island might be a sinking prospect. I needn't have worried. The event, returning Saturday&–Sunday, Sept. 20&–21, will go off as planned and acts were just announced last week. The lineup on Saturday (the "electronica" day) includes Justice, TV on the Radio, Goldfrapp, Hot Chip, CSS, Aesop Rock, Antibalas and Amon Tobin. On Sunday's more indie-rock-slanted lineup, it's the Raconteurs, Vampire Weekend, Spiritualized, Okkervil River, the Kills, Tegan & Sara, Dr. Dog and John Vanderslice. The setup is unique—there's no parking out on the island, but the public shuttles work smoothly. Festival-goers ride from the Giants' ballpark, over the Bay Bridge, to the island. Last year, I never waited for more than 10 minutes in line for the shuttles, and the experience engendered a spirit of community excitement on the way there and back. The grounds, limited by the island, weren't too sprawling, the sound was great and the added attractions—like an '80s video arcade and a Ferris wheel—are an inspired touch. You could call it the festival for people who hate festivals, and you wouldn't be too far off the mark. Tickets are $65 per day, $115 for a two-day pass, and go on sale Friday, May 30. [ http://www.treasureislandfestival.com ]www.treasureislandfestival.com.